Prime Minister Narendra Modi has taken a swipe at his Pakistani counterpart Imran Khan over his claim that Indo-Pak peace talks will have a better chance if the BJP wins in Lok Sabha polls, saying it was an attempt by the former cricketer to influence the elections in India with his reverse swing. "We should not forget that Imran Khan was a cricketer and his recent statement was an attempt at reverse swing to influence Indian elections. However, Indians know how to hit a 'helicopter shot' on a reverse swinging delivery," the top BJP leader told The Times of India in an interview published on Wednesday. "We should also remember how he used Modi's name during Pakistan elections. His slogan was: 'Modi ka jo yaar hai, woh gaddar hai woh gaddar hai'," the prime minister added. The Congress had used Khan's comments to corner the BJP, which has often hurled pro-Pakistan barbs at its rivals. In the interview, Modi also expressed confidence that the BJP will win more seats than before, saying he is seeing "unprecedented" support for the party and that the first phase of polling on April 11 has reinforced his confidence. To a question about criticism that that the BJP has resorted to "hyper-nationalism" instead of focusing on real issues in its campaign, he asserted that a large part of speeches is dedicated to the issues of development but they never make headlines. 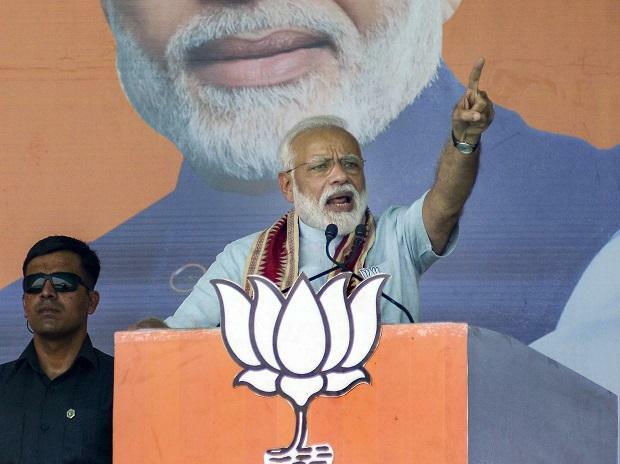 Attacking his rivals like the Congress, Modi said, "Those who did absolutely nothing on the critical issue of national security are now having problems when India's national security doctrine has seen a strategic shift." Hitting back at the opposition's charge of politicisation of armed forces, he said, "Politicisation of the Army happened when they created a fake news of revolt by the Army to gain sympathy. It happened when credit for victory in the 1971 war was given to Indira ji." Asserting that patriotism is not a "disease", he said as hyper-secularism was invented to strike at the root of India's culture and ethos, similarly the terminology of hyper-nationalism has been invented to portray 'deshbhakti' (patriotism) in poor light. With political experts wondering if the BJP in Uttar Pradesh will be able to repeat its feat of 2014 elections, when it had won 71 of the state's 80 seats with its ally winning two more, he said the state will vote for those who put India first not those who put family first. The uniting factor for the SP-BSP grand alliance in the state is personal survival and personal interest, he alleged, and asserted that the state is witnessing double-engine growth with central and state governments working in tandem to transform lives. Attacking his rivals, Modi said parties like the Congress want to take India back to the era of "corruption and loot". Asked about the opposition's attack on his government over the escape of economic offenders like Vijay Mallya and Nirav Modi, he said it should not be forgotten that his dispensation got corruption accused like Christian Michel, Rajiv Saxena and Deepak Talwar back. "I will like to again state that anyone who has looted the nation will not be spared," he added.